For Ireland I'll Not Tell Her Name Irish Lyrics And Chords, A traditional Irish song. I only ever heard The Wolfe Tones sing this beautifull love song,To hear Tommy Byrne of the Tones sing it would send a shiver down your spine. What a singer he is,and such beautiful harmonies from The Wolfe Tones. Sheet music included. The song was written by John Barry Oge from County Kerry. I asked Brian Warfield from The Wolfe Tones where he got the song from and he said he got it when it was written in Gaelic and translated it to English. 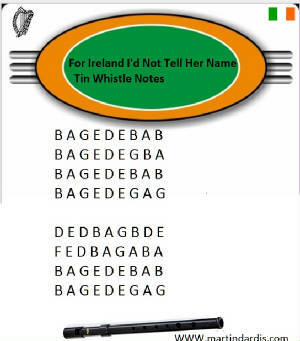 The tin whistle notes are included along with a video to help you on your way to learning the song. But for Ireland i'd[G] not tell her[D] name.